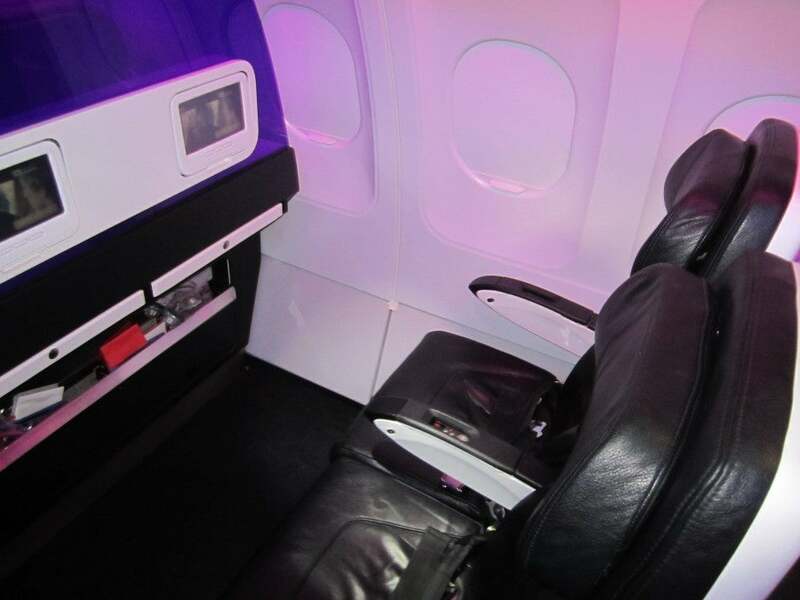 Flight Review: Virgin America Main Cabin Select – Is It Worth It? Main Cabin Select is rows 3 and 10, the first row of coach and the exit row. 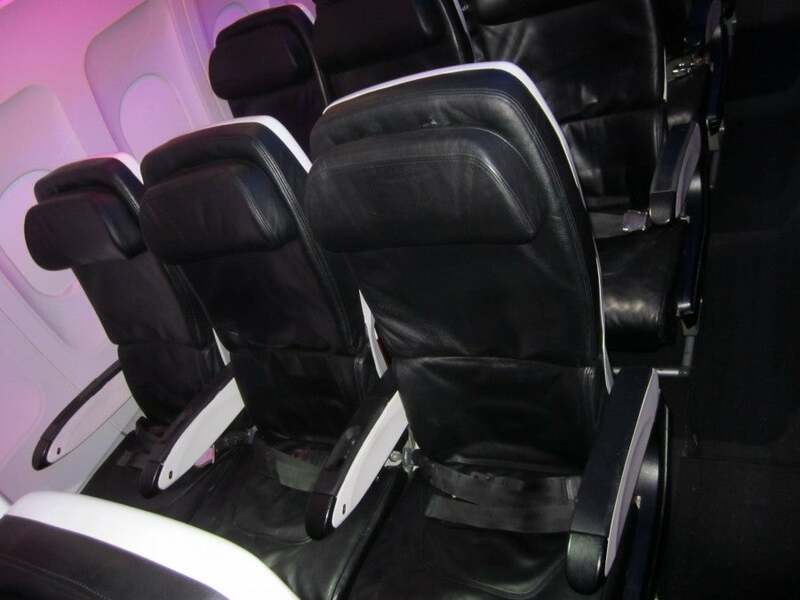 TPG Managing Editor Eric chimes in with his thoughts on Virgin America’s Main Cabin Select, which I gave him for a work trip, since I got a 3 pack of flights at a great discount with Gilt City. With more and more airlines putting in some sort of “premium” product in their coach cabin—see TPG’s recent post on Delta’s Economy Comfort and the imminent Main Cabin Extra on American—I thought I’d write up my recent experience flying Virgin America’s Main Cabin Select from LAX-JFK. Main Cabin Select on Virgin America basically refers to the bulkhead and exit rows—so on the A320 I was on, that was row 3 and row 10, a total of 12 seats. My flights were pretty light, so I opted for row 3 since it looked like there would be an empty middle seat, and it meant I could be one of the first on and off the plane and not have to worry about overhead space. My seat with the tray table pulled out--didn't quite make for a good work desk. 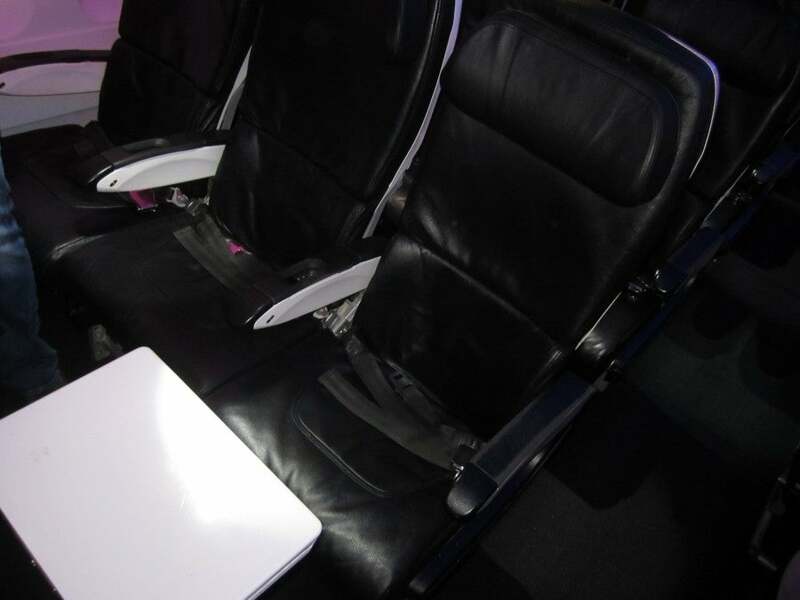 Regular Main Cabin seats are black leather, have 32 inches of pitch, and are just shy of 20 inches wide, with 3-5 inches of recline and individual seatback video screens for entertainment. Movies and TV shows cost $8 to view, and you have to pay for food and drinks other than soda, juice, coffee, tea and water. -Complimentary food and drink including alcohol and specialty drinks like bottled iced tea. -All the entertainment was free. -I got priority check-in and security screening in the premium class lines (which actually were faster this time at both LAX and JFK!). -I was one of the first to board since Main Cabin Select boarding is right after first class, which is just 8 seats. -I could also check a single bag of up to 50 lbs for free (instead of paying $25), which was good since my trip was for just about a week. A row of regular Main Cabin seats. I’m a bit of a control freak, so I like going onto a flight knowing as much as possible about what’s going to happen and be available on board as possible. I checked out the Flying With Us tab, and was able to scan all the entertainment options including movies on demand, satellite TV, radio and games, and everything on the menu (since my flight was over 2 hours). I also liked the fact that I knew for sure my flight would have GoGo in-flight WiFi, which meant I could spend the flight working and wouldn’t lose an entire day of productivity flying from coast to coast. For the seat itself, yes, it was nice having the extra room and not having to get up every time my seatmate wanted to use the lavatory, plus it was nice to scroll through the movies and be able to pick anything I wanted to watch. If my flights hadn’t been early morning ones, I might even have indulged in a cocktail or two since they would have been free, but I settled for some snacks and a sandwich. Here’s a note of advice: order early because they ran out of options I wanted on both flights. Because I had the bulkhead seat, it was also difficult to use the table as a desk since it was so far away from my seat, so I had to keep my computer on my lap in order to get work done, though it was nice to have a personal power port to keep my laptop charged (every row of the plane has two). All snacks, meals and food are free for Main Cabin Select passengers. Here’s where we get to the real question: is the experience worth it? I priced it out, just to check. My flight would have cost just $279.60 in the Main Cabin, but the same itinerary costs nearly four times as much in Main Cabin Select, ringing in at a grand total of $1063.60. Luckily I had a voucher that I used, so I wasn’t on the hook for the fare. In terms of Elevate points I’d earn, which are calculated at the rate of 5 Elevate points per dollar spent on base fare (excluding taxes and fees), I’d earn 1,290 points on the base fare in Main Cabin, and 5,210 in Main Cabin Select. Just to put it in perspective, in Elevate points, the same roundtrip itinerary would cost me either 12,000 points plus $5 for Main Cabin, or 48,466 points plus $5 for Main Cabin Select—over four times as much! There is a last-minute upgrade option that opens 24 hours in advance on Virgin America, but for some reason on my flights, it wasn’t available for moving from Main Cabin to Main Cabin Select or from Main Cabin Select to First Class, even though there were open seats. However, according to this chart on Virgin America’s website, for my flights, to upgrade from the Main Cabin to Main Cabin Select on each leg would have cost $129 each way plus taxes and fees. Much more affordable, though it basically doubles the base Main Cabin fare, and you’d be hard pressed to order enough entertainment and food to make up the cost. Personally, I like the perks of priority check-in, boarding, baggage and not worrying about being nickel-and-dimed for every little expense while basically being held captive aboard an airplane, but the price differential is just way too expensive for the actual difference in service and product you get flying Main Cabin Select. My seat with the tray table pulled out–didn’t quite make for a good work desk. My power outlet, so I could work the whole flight without my laptop battery running out.